We happily survived our visiting nephews. There were some tense moments here and there, but overall, they are good kids. It is fun to talk to them and hear their ever-expanding take on the world around us. 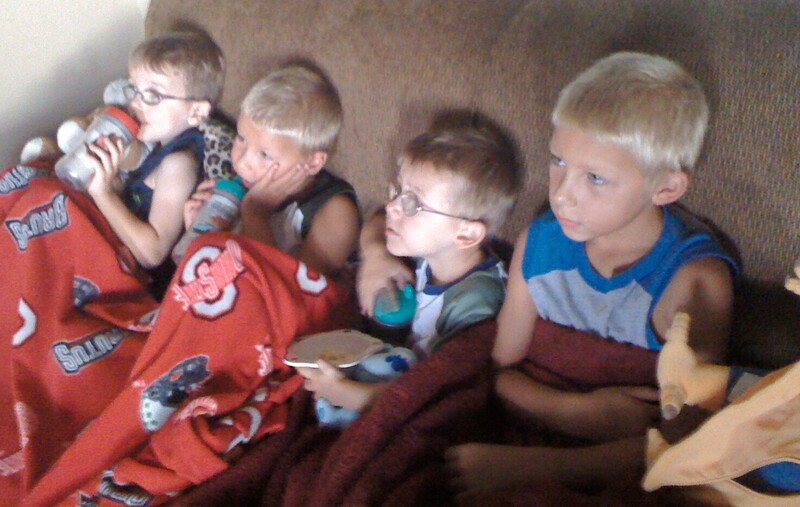 The boys have a movie night with their cousins. Popcorn anyone? Grandma and Grandpa picked all the boys up (T.Puzzle and Full Speed included) this morning and took them to church. With all the activity we’ve experienced in the past few weeks, my mommy-instinct was on high alert that little T.Puzzle needed to attempt a nap today. I tried to explain this as clearly as possible to Mad Dog who chose to politely ignore my warning. As we headed to pick up the boys, Mad Dog decides that this is the day he HAS to sync Grandma’s phone. A phone sync can be a long and tedious process. I knew, I mean really, really KNEW, we were running out of time concerning little T.Puzzle. It was like I wasn’t even talking. Mad Dog was convinced the phone sync would be fast and we’d get little T.Puzzle home soon enough (I strongly disagreed). Well over an hour later the phone was still backing up and little T.Puzzle’s mood had hit the danger zone. Never doubt the mommy-instinct. Those who go against it inevitably will have an irate wife experiencing her own meltdown. Or something like that (insert your own worst nightmare here). yikes…I agree with you…mommy instinct and wife instinct rules…sometimes they end of learning the hard way to listen to us the first time!